Today, I feel both satisfied and a little guilty. Why? Well, as you might recall, back in December my business associate, Chelsea Nguyen of CN Vision Image Consulting and I launched our dream project CAPTIVATING! So today I’m excited because we’ve published our second edition of CAPTIVATING! last night. I feel guilty because Bold Blind Beauty will always be my first love and it feels like I’m cheating. In truth, I know my limitations and I decided this year my focus will be mindfulness. Since my purpose is to help make the world more inclusive as long as I remain on this course I’ll be okay. Bold Blind Beauty’s mission to improve humanity by changing the way we perceive one another remains the same. While intentionally broad, I believe if we can give people a chance by getting to know them, then we’re all enriched. Is it a perfect plan? No, it isn’t but then again as homo sapiens, we aren’t perfect either. When you think about it, if we can’t get along with all members of our families how can we possibly hope the same for strangers? We are never going to achieve 100% consensus on anything and honestly, I wouldn’t even waste my time trying. What’s so cool about both Bold Blind Beauty and CAPTIVATING! is the idea of acceptance. Will everyone agree with us? No, and that’s okay. We are here for people who share a mutual desire to improve humanity period! Since Abby is a very important element here we are also looking to build upon her story. Stay tuned! Promo video compliments of our filmmaker/videographer guest, Juan Alcazar of YouTube Channel J5 Productions. 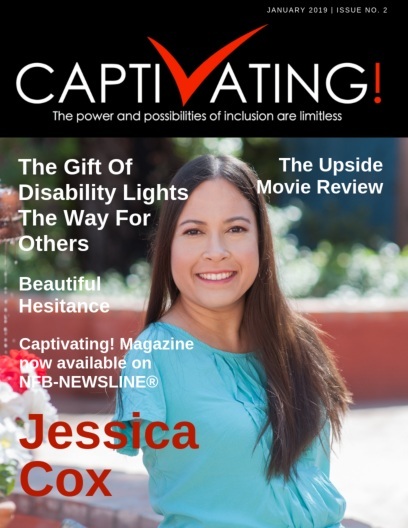 The cover of the January edition of CAPTIVATING! with the logo and name of the magazine on the top quarter. “CAPTIVATING” is written in white bold all capital letters except for the “V” which is drawn with an artistic style font in bold red and looks like a big check mark. And at the end of the word, “CAPTIVATING” is also a red bold exclamation mark. Our featured guest, Jessica Cox is smiling while looking straight into the camera in an outdoor shot. She is wearing a light blue short-sleeved crew-neck top. Her long brown hair, parted down the middle, is draped over her left shoulder. A close-up photo of Jessica looking into a makeup mirror while applying her mascara with her right foot. She is wearing a light blue short-sleeved crew-neck top. Her long brown hair, parted down the middle, is draped down her back and over her right shoulder. Congratulations Steph. You are such an inspiration. Happy new Year. I love the work that you are doing with BBB and CAPTIVATING! I can’t wait to see what the future holds!